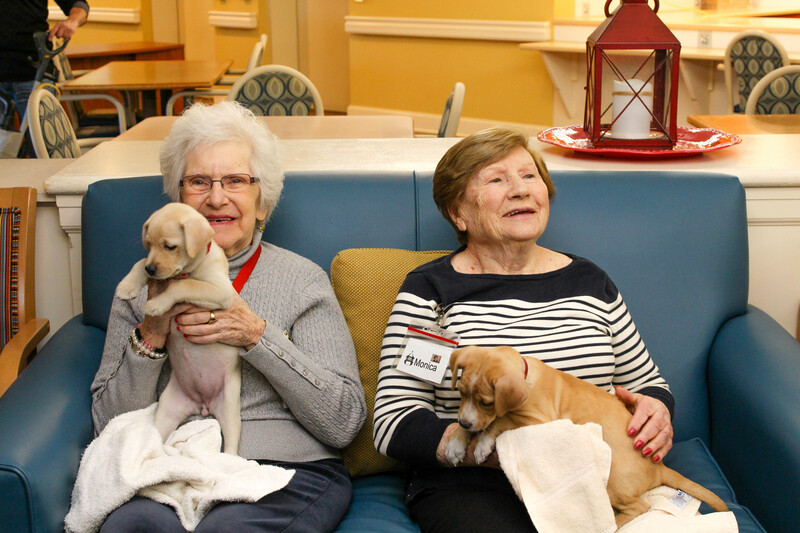 For Shari Leventhal, the director of recreation at the Harbor House in Oyster Bay, few things are better for the senior population than a visit from puppies. The visits to Harbor House are part of the North Shore Animal League America’s Shelter Pet Outreach Team (SPOT) program, which makes visits to those who are alone, ill, or live in specialized care facilities. 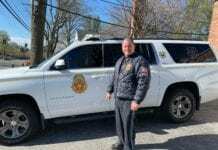 The program, which is based out of the league’s headquarters in Port Washington, started by taking puppies and kittens to visit people around the area. 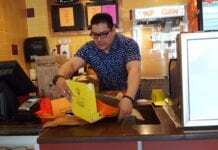 “It was started because the volunteers had heard about the potential positive effects on the health of seniors and their emotional and cognitive well-being,” said Diane Alexander, a spokeswoman for the organization. The pets who participate — mostly puppies between eight to 12 weeks old and older dogs — are all up for adoption on the weekends. That means the dogs who go out to visit with volunteers vary from week to week. Alexander said that the dogs chosen are the ones not afraid of people or loud noises, and the participants can visit as many as seven facilities per week. She added that the pets usually spend about 90 minutes at each facility they visit, with the length varying on how many people want to participate. The program is not just to visit the elderly. The dogs also make visits to special education schools, where the pets help the children develop a sense of empathy and reduce anxiety. The benefits that Leventhal described of the group’s visit to Harbor House are shared with other senior living facilities. The visit is a mental and physical stimulation for the residents and provides an event where they can socialize with one another. According to the Animal League, the visits help seniors recuperate from illness more quickly, relaxes them and significantly reduces loneliness. A study conducted in New York, Missouri and Texas nursing homes showed patients’ medication costs dropped an average of 69 percent when pets were allowed to visit.